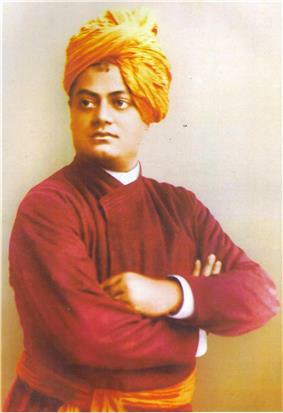 In January 1897, Swami Vivekananda arrived in Colombo with his small group of Western disciples. Two monasteries were founded by him, one at Belur, which became the headquarters of Ramakrishna Mission and the other at Mayavati on the Himalayas,in Champawat Dist. Uttrakhand called the Advaita Ashrama. These monasteries were meant to receive and train young men who would eventually become sannyasis of the Ramakrishna Mission, and to give them a training for their work. The same year the philanthropic activity was started and relief of the famine was carried out. Swami Vivekananda's days as a parivrajaka (wandering monk) before his visit to Parliament of Religions, took him through many parts of India and he visited several architectural monuments like the Taj Mahal, Fatehpur Sikri palaces, Diwan–I–Khas, palaces of Rajasthan, ancient temples of Maharashtra, Gujarat, Karnataka, Tamil Nadu and other places. During his tour in America and Europe, he came across buildings of architectural importance of Modern, Medieval, Gothic and Renaissance styles. It is reported that Vivekananda incorporated these ideas in the design of the Belur Math temple. Swami Vijnanananda, a brother-monk of Swami Vivekananda and one of the monastic disciples of Ramakrishna, who was, in his pre-monastic life, a civil engineer, designed the temple according to the ideas of Vivekananda and Swami Shivananda, the then President of Belur Math laid the foundation stone on 16 May 1935. The massive construction was handled by Martin Burn & Co.. The mission proclaims the Belur Math as, "A Symphony in Architecture". 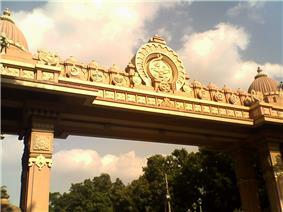 The entrance gate of Belur Math has symbols of all religions . 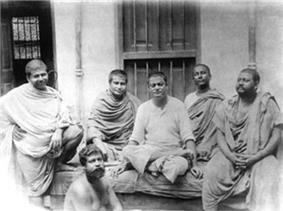 Monastic disciples, Trigunatitananda, Shivananda, Swami Vivekananda, Turiyananda, Brahmananda. Below Sadananda, at Belur Math, June 20, 1899. 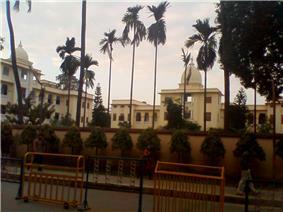 Vivekananda University on Belur Math campus. The 40-acre (160,000 m2) campus of the Belur Math on the banks of the Ganges includes temples dedicated to Ramakrishna, Sarada Devi and Swami Vivekananda, in which their relics are enshrined, and the main monastery of the Ramakrishna Order. The campus also houses a Museum containing articles connected with the history of Ramakrishna Math and Mission. Several educational institutions affiliated with the Ramakrishna Mission are situated in the vast campus adjacent to Belur Math. 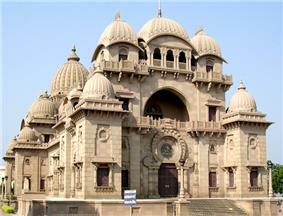 The Belur Math is considered as one of the prime tourist spots near Kolkota and place of pilgrimage by devotees. The ex-president Abdul Kalam regarded Belur Math as a "place of heritage and national importance." The design of the temple was envisioned by Swami Vivekananda and the architect was Swami Vijnanananda, a direct monastic disciple of Ramakrishna. 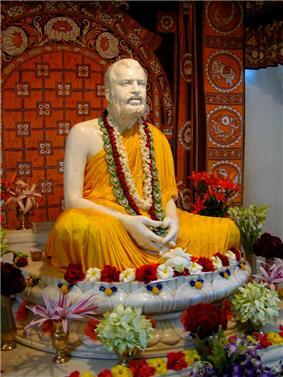 Sri Ramakrishna Temple was consecrated on 14 January, the Makar Sankranti Day in 1938. The Ramakrishna temple at the Belur Math is designed to "celebrate the diversity of Indian Religions" and resembles a temple, a mosque, a church if seen from different positions. 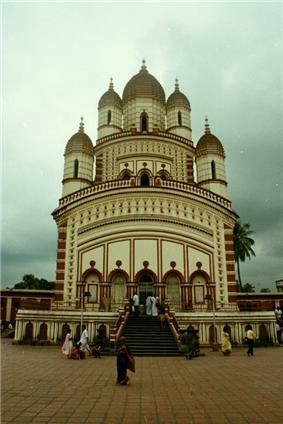 The architectural style and symbolism from a number of religions have been incorporated into the design of the temple at Belur Math, to convey the "universal faith" in which the movement believes. The temple is considered as a prime example of the importance of "material dimension" of religion. The main entrance of the temple, has a facade influenced by Buddhist style. The structure which rises over the entrance is modelled on the Hindu temples of South India with their lofty towers. The windows and balconies inside the temple draw upon the Rajput (Hindu) and Mughal (Islamic) style of north India. The central dome is derived from European architecture of the Renaissance period. The ground plan is in the shape of Christian cross. The height of the temple is 112.5 feet (34.3 m) and covers a total area of 32,900 sq ft (3,060 m2). The temple mainly is built of chunar stone and some portion in the front is of cement. The high entrance of the temple is like a South Indian Gopuram and the pillars on both sides represent Buddhistic architectural style. The three umbrella-like domes on the top built in Rajput-Moghul styles give an idea of thatched roofs of the village Kamarpukur. The circular portion of the entrance is an intermingling of Ajanta style with Hindu architecture and within it, placing the emblem of the Order is representation of beauty and solemnity. Just above seen is a replica of a Shiva lingam. The natmandira, the spacious congregational hall attached to the sanctum, resembles a church. The pillars in a line on its both sides are according to Doric or Greek style and their decorations are according to the Meenakshi Temple at Madurai in Tamil Nadu. The hanging balconies above the temple nave and the windows show the effect of Moghul architecture. The broad parikrama path for doing circumambulatory rounds on all sides of the garbhamandira (sanctum sanctorum) are built like Buddhist chaityas and Christian Churches. The lattice work statues of Navagraha figures are etched on semi-circular top of outside the temple. The golden kalasha is placed on the top of the temple and has a full-bloomed lotus or Amlaca below. The architecture of the big dome and of the other domes show a shade of Islamic, Rajput and Lingaraj Temple styles. The entrance doors on both east and west of the temple having pillars on both sides are like Rajasthan Chittor kirti-stambha, the victory-pillars. Ganesha and Hanuman images, representing success and power. Swami Vivekananda temple Belur Math. 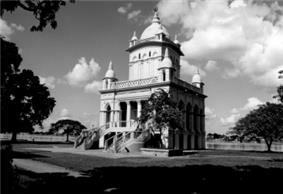 The Swami Vivekananda Temple stands on the spot where Swami Vivekananda’s mortal remains were cremated in 1902. 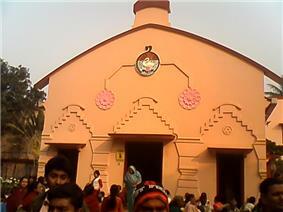 Consecrated on 28 January 1924, the temple has in its upper storey an alabaster OM (in Bengali characters). Beside the temple stands a bel (bilva) tree in the place of the original bel tree under which Swami Vivekananda used to sit and near which, according to his wish, his body was cremated. On 4 July 1902 at Belur Math, he taught Vedanta philosophy to some pupils in the morning. He had a walk with Swami Premananda, a brother-disciple, and gave him instructions concerning the future of the Ramakrishna Math. He left his body (died) in the evening after a session of prayer at Belur Math. He was 39. Vivekananda had fulfilled his own prophecy of not living to be forty-years old. Sarada Mandir the temple of Saradama at the entrance of Belur Math . The Holy Mother's temple is dedicated to Sarada Devi, the spiritual consort of Ramakrishna.The holy mother's temple is right at the entrance of Belur Math . The temple is over the area where her mortal remains were consigned to flames. The temple of the Holy Mother was consecrated on 21 December 1921. Another temple dedicated to Swami Brahmananda—a direct disciple of Ramakrishna and the first president of the Ramakrishna Math and Ramakrishna Mission—is situated near Holy Mother's temple. Brahmachari Gurudas (January 2007). "A Visit to the Belur Math: January 1907". Prabuddha Bharata. Dutta, Krishna (2003). Calcutta: a cultural and literary history (illustrated ed.). Signal Books. p. 255. ^ "A Symphony in Architecture - Ramakrishna Temple, Belur Math". Retrieved 2013-07-11. ^ Sarina Singh; Joe Bindloss; Paul Clammer; Janine Eberle. India. p. 452. ^ Hendrik Kraemer. World Cultures and World Religions. p. 151. ^ Swami Tattwajnanananda. "prelude". A Symphony in Architecture Ramakrishna Temple Belur Math. ^ Swami Tattwajnanananda. A Symphony in Architecture Ramakrishna Temple Belur Math. ^ "Belur Math". Retrieved 2008-10-10. ^ SAHA, SUBHRO (5 August 2004). "A Calcutta that’s quintessential". The Telegraph. Retrieved 2009-05-06. ^ "By boat, a pilgrim’s triangle". The Telegraph. 13 March 2003. Retrieved 2009-05-06. ^ Yengkhom, Sumati (31 July 2003). "Eastern Railway to start train to Belurmath". The Economic Times. Retrieved 2009-05-06. ^ "Belur a heritage site: President". Financial Times Ltd. 2 October 2004. Retrieved 2009-05-06. ^ Pilgrimage Centers of India. p. 167. ^ "Travel: Kolkata Surprise". MySinchew. 2008-10-18. Retrieved 2009-05-08. ^ Simmons, Graham (18 December 2005). "Soul places of India". The Sunday Morning Herald. Retrieved 2009-05-08. The Ramakrishna Mission, at Belur Math in Calcutta, is known for its charitable works and outstanding temple - Hindu, Saracen and Arabic design on a foundation of a Christian cross. ^ a b c Open University Course Team. Introduction to the Humanities. p. 75. ^ Pilgrimage Centers of India. p. 167. This symbolises the main message of the master that all religions and men are essentially one and united. ^ a b Sengupta, Jatindra Chandra (1965). West Bengal district gazetteers 5. State editor, West Bengal District Gazetteers. p. 624. ^ "Oasis of peace". The Statesman. 1 March 2005. Retrieved 2009-05-06. ^ a b c d e f g Dutta, Indrani (1 April 2005). "Evolution of a spiritual movement on display". ^ Cyrus R. Pangborn. "The Ramakrishna Math and Mission". Hinduism: New Essays in the History of Religions. p. 118. ^ "R K Mission's flood relief measures continue". The Times of India. 14 December 2008. Retrieved 2009-05-08. ^ "An eventful year for RK Mission". The Hindu. 23 December 2005. Retrieved 2009-05-08. ^ "Mission lists relief work". The Telegraph. 22 December 2003. Retrieved 2009-05-08. ^ "Day of anjali & attraction". The Telegraph. 7 October 2008. Archived from the original on 10 October 2008. Retrieved 2008-10-10. ^ Sanyal, Sourav (20 October 2007). 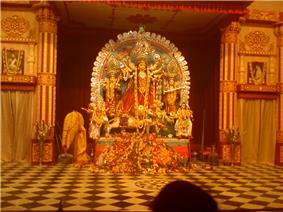 "Kolkata pays tribute to sacred feminine". NDTV. Retrieved 2009-05-06. The wooden staircase and the lotus woodwork of Victoria Hall in Chennai, where Vivekananda gave inspiring speeches to a large congregation have been brought over. A few displays away from this is a show on Miss Josephine MacLeod who met Swamji in the U.S. in 1895 and served India for 40 years thereafter. She played an important role in the Ramakrishna movement. At this enclosure is a crystal image of Swamiji that was done by the Paris jeweller, René Lalique. Sarada Devi's pilgrimage to Chennai, Madurai and Bangalore has also been exhibited along with the items used by her then in 1911. The museum show cases a huge replica of Swami Vivekananda in the front of the Chicago Art Institute where the famous Parliament of the World's Religions was held in September 1893. Alongside the same display is a letter by Jamshedji Tata, Swami Vivekananda's co-passenger on the trip. The letter reveals an important and well-known work that Jamshedji did, inspired by Swamiji—the founding of the Indian Institute of Science at Bangalore. The museum has a realistic recreation of the Panchavati—the clutch of five sacred trees of the Dakshineswar Kali Temple where Ramakrishna practised sadhana (spiritual disciplines). The black stone bowl from which Ramakrishna took payasam (a sweet Indian dish) during his final days while suffering from throat cancer and the pillow he had used, in the house in Calcutta where he spent his last few months are on display. Ramakrishna's room in the house where he distributed ochre clothes to 12 disciples anointing Vivekananda (then Narendranath) as their leader has also been shown with a model of Ramakrishna bestowing grace on his disciples and the footwear used by Ramakrishna has been put on the model. The room at Dakshineswar where Ramakrishna lived has been recreated with display of clothes and other objects used by him, the tanpura used by Vivekananda to sing to his master, and the copies of two charcoal drawings sketched by Ramakrishna are on display. The museum chronicles the growth of the movement and the Bengal of those times.